As some of you know I got married last month and have been away on a long honeymoon, but I'm finally back :) I'll make this a small off topic personal entry, hope people don't mind. We climbed Kilimanjaro, probably hardest thing I've ever done. We walked for 5 days to reach the main ascent point, most of this was for altitude adjustment. It can be done quicker but then you reduce your chances of making it to the top. On the actual day of the final ascent you start off at midnight, it then takes six and a half hours to reach the top. It's 5800M at the top and almost -2o degrees celsuis. Many people suffer from some level of altitude sickness, passing people as they are vomiting wasn't uncommon. I became nauseous on day 2 and had a constant 24/7 migraine for the rest of the 7 days, even with the help of Diamox. The last two hours are excruciating, the only thing that keeps you going is it's harder to go down than it is to just keep going up. At the top the views are fantastic and the glacier is stunning, just a shame it's shrinking at such a fast rate and not likely to be there in 15 years time - definitely one of those things to do before it's gone. Then it's three and a half hours back down. You break for 45 mins, then another 4 hours walking back to camp. So you eventually get back about around 4pm, where you are beyond exhaustion. We then went on safari in Tanzania, which was much more relaxing. The highlight of this was the night we stayed in a camp site. We where fed the line about the animals walking around the camp, but thought it was an exaggeration to help tourism. A few minutes after I arrived I went to the mens room, then to my complete surprise a ginourmous bull elephant walked past the window, so close I could have touched it. It walked into the camp and stuck it's trunk in the main water storage tank for a drink, with the entire camp site crowding around. Then a herd of zebra walked through the centre of the camp, just metres from our tent and buffalo came to feed at the ends of the grounds. We where also told wild boars frequent the camp at night, so we have to remove any food or empty wrappers from our tent. Safe to say I didn't sleep a wink all night as all I could hear was the hoofs and the snorting of animals outside. Finally we had a relaxing beach holiday on the island of Pemba at the Fundu Lagoon which I'd really recommend if you just want to get away from the hustle and bustle of modern day life. 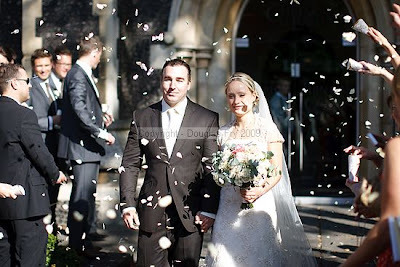 For the morbidly curious, you can see our wedding day photo's online now, http://www.douglasfry.com/darielle-and-mark/. PS: kris, is that you on the picture? But congratz once again Darielle and Mark ! Congratulations Mark, you look very happy on the pictures (BTW great photographer!). When are you going to climb the Aconcagua? That's Salaboy's homeland.